Installers should be craftsmen with construction experience. Installers should read the instructions. Follow all OSHA and other safety requirements. StonePly panels are a finished natural stone product. Use care to protect them during installation. Lateral support and bridging should be installed. 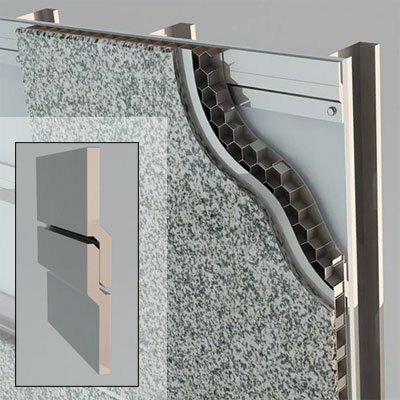 Do not rely on StonePly stone panels to provide lateral support for wall framing. The steel stud framing should have a maximum variation from a true plan of 1/8 inch in 10 feet. Correct any defects prior to proceeding with stone panel installation. Framing studs must be located with studs at panel joint locations. Stone panels should be stored in a clean, dry area. While StonePly panels are strong and impact resistant, keep in mind that they are a finished product. The natural stone facing can be chipped at the edges and softer stones can be scratched. Limestone, marble, travertine, and other softer stones can be stained by dirt, mud, or construction materials. As they are removed from their crates, StonePly stone panels should be placed on carpet, foam, or other padded surface to protect the stone edges. Also consider laying the uncrated stone panels out in the order they are to be installed to speed up the process and minimize mistakes. Use the shop drawings, tape, and laser level to mark the exact positions of panels on the wall. Check to ensure that each panel edge will have framing support. Using a laser, find the most outward point of the framing. This will be the installing "plane," as all other panels will need to be shimmed out to that level. Use string lines or a rotating laser, set at least two inches from the most outward point of the framing as a reference line to establish the plane for the entire StonePly stone panel faces. Starting with the bottom row, position the Z-clip sections on the wall as indicated by the shop drawings. Using the C-clamps, clamp the Z-clip section into place on the steel framing and screw the Z-clip sections onto the steel framing. Do not exceed a maximum of 24" on center between Z-clips. Start with the bottom row of stone panels and work up. To attach the Z-clips to the panels, lay panel face down. Mark the Z-clip locations and attach the Z-clips to the back of the panel with a bead of PL Premium Adhesive and #8 stainless steel metal screws at 10" on-center (or more often if required by the engineering). When installing the screws, use a drill/drive with a clutch to control torque. Installation can progress vertically or horizontally depending on how the stone panels are lain out. Use care when aligning stone panel joints. Use spacers between the panels to maintain joint width. These are general guidelines, not full instructions. Every job is different and a competent, experienced professional, skilled in construction, carpentry, safety and proper use of tools should direct the work. Consult with a professional engineer to produce calculation and recommendations for fastener spacing to meet wind loading and anchor spacing.